This article is part of the Winter in July Blogathon hosted by Moon in Gemini. It's hot out there this summer, at least here in the Midwest (the temperature was 92 degrees Fahrenheit at 10 am this morning). I'm beating the heat by watching some of my favorite classic movies set in winter, so I thought I'd share my top five picks plus some runners-up and where you can watch them. The movies are in chronological order and the highlighted text has links to full-length articles. 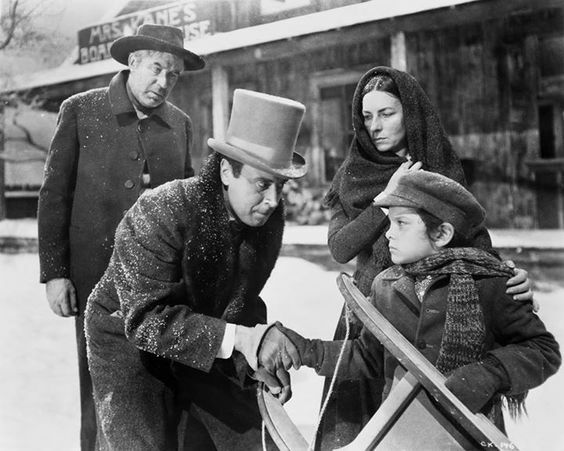 Harry Shannon, George Coulouris, Agnes Moorehead, and Buddy Swan in Citizen Kane (1941). Wisconsin native Orson Welles filled his landmark film with references to snow. The Christmas Day scene where a young Charles Foster Kane (played by Buddy Swan) is taken from his parents is the linchpin for the entire film (it also happens to be a masterclass in deep-focus cinematography). The newspaper magnate spends the rest of the film trying to replace his stolen childhood with a mansion on the "deserts of the Gulf Coast" in Florida stuffed with artwork and, most significantly, a snowglobe. Runner-up: Welles second film, the Indiana-set The Magnificent Ambersons (1942), has a Christmas Eve ball and a delightfully snowy car ride. Citizen Kane is airing at 4:30 pm Aug. 27 on TCM. Available on Blu-ray, DVD, and video on demand. The Magnificent Ambersons is airing at 8 pm Aug. 27 on TCM. DVD and video on demand. 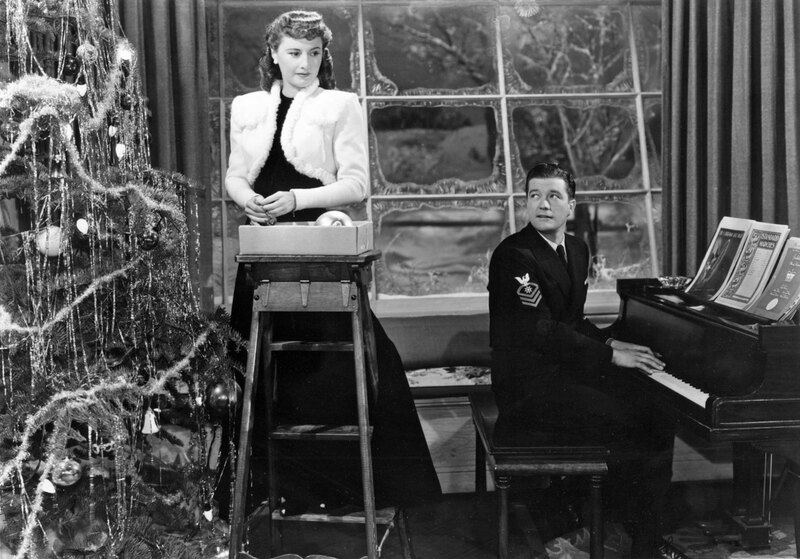 Barbara Stanwyck and Dennis Morgan in Christmas in Connecticut (1945). 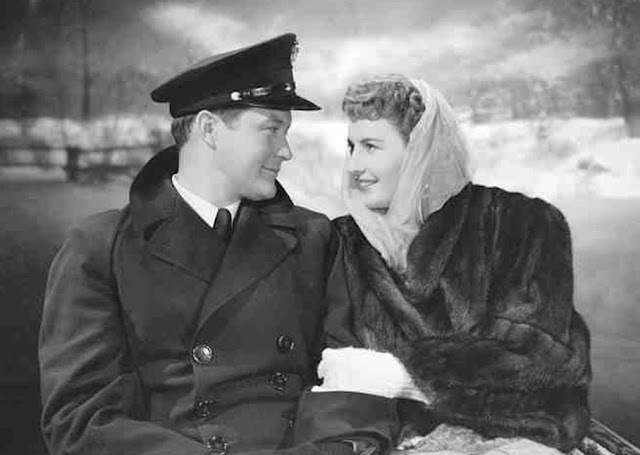 There's a lot of great old Hollywood Christmas movies, but, for my money, the best snowy holiday scene is Dennis Morgan and Barbara Stanwyck's romantic sleigh-ride in this fan-favorite romantic comedy. Runner-up: Another charming winter scene is handsome angel Cary Grant taking neglected pastor's wife Loretta Young ice-skating in The Bishop's Wife (1948). Christmas in Connecticut and The Bishop's Wife are available on DVD and video on demand. 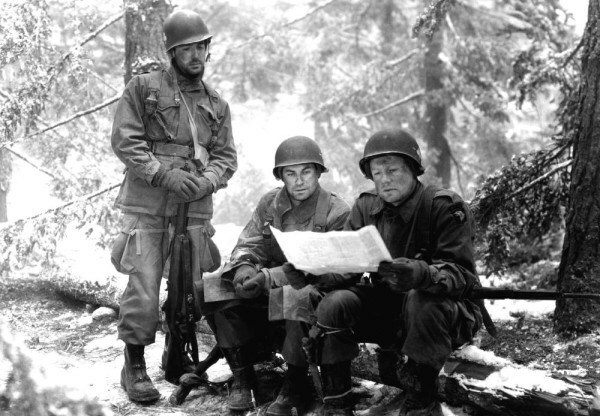 Ricardo Montalban, John Hodiak, and Van Johnson in Battleground (1949). Director William Wellman's gritty World War II film about a group of 101st Airborne soldiers who are battling the German army and the harsh winter during the siege of Bastogne is the forerunner of films like Saving Private Ryan (1998) and Dunkirk (2017). Battleground is filled with wonderful actors like Van Johnson, James Whitmore, George Murphy, and Leon Ames, but the poignant performance of Ricardo Montalban as Latino soldier Roderigues, is perhaps the most memorable. Roderigues, who is from Los Angeles, is delighted by his first experience with snow, but, as the battle wears on, the elements become a life-threatening danger. Runner-up: Wellman's Western Track of the Cat (1954) is a snow-filled tone poem about a dysfunctional pioneer family who are hunting a killer panther (pronounced "painter" in the film). This film features the great character actor Beulah Bondi's favorite among her own screen roles. Battleground and Track of the Cat are available on DVD and video on demand. James Arness in The Thing from Another World (1951). 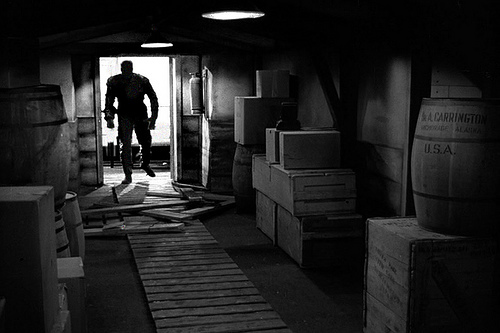 This science-fiction thriller from producer Howard Hawks is about a gigantic blood-sucking alien (James Arness) who menaces the inhabitants of an Arctic research station. Not nearly as scary today as it must have been in 1951, this film is still a lot of fun, especially the flirty antics of leads Kenneth Tobey and Margaret Sheridan and the performance of Robert Cornthwaite as the lead scientist. He spouts scientific gobbledygook likes his life depends on it while wearing a ridiculous-looking fur hat. The Thing from Another World is airing at 4:15 pm Oct. 6 on TCM. Streaming on FilmStruck, DVD, and video on demand. 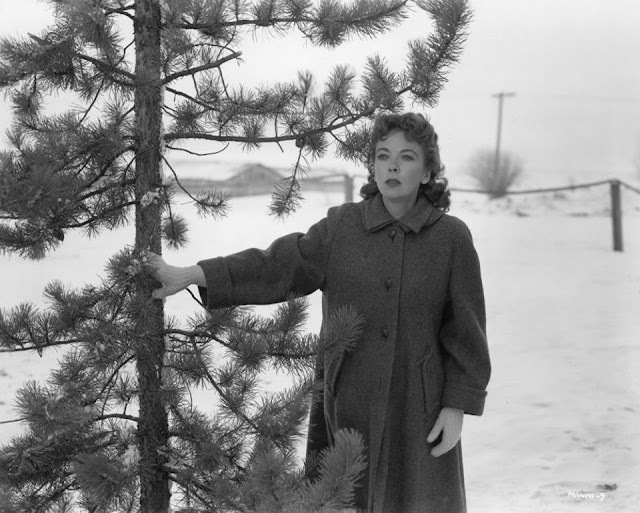 Ida Lupino in On Dangerous Ground (1952). The gritty urban landscapes of film noir don't usually include snow, but there are a few notable exceptions. It's a Wonderful Life (1946) is probably the most famous example, but there's also this film about a tightly wound cop (Robert Ryan) who joins the manhunt for a killer in a rural area. Exceptional in every way, especially director Nicholas Ray's use of the snowy landscape as a metaphor for despair and loneliness. If there was any justice, both star Ida Lupino and composer Bernard Herrmann would have received Academy Award nominations. Runner-up: A Woman's Face (1941), starring Joan Crawford, is an early example of Scandinavian-set noir that has a nail-biting cable car climax. 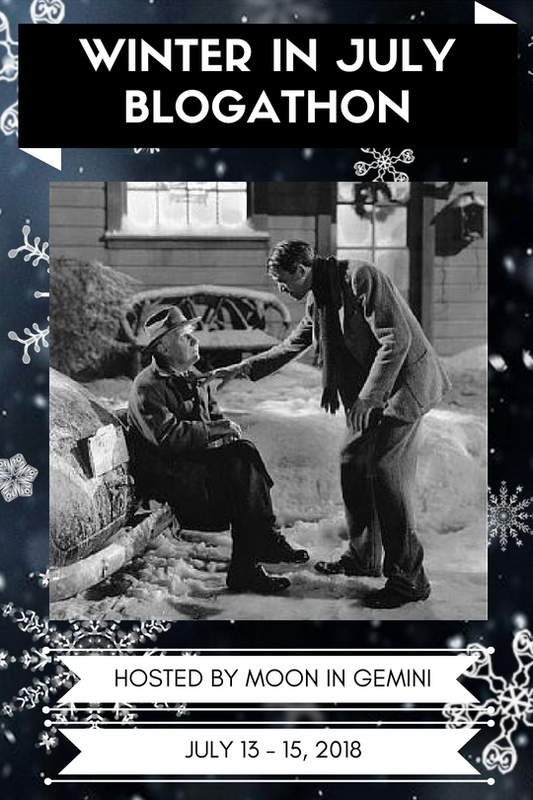 It's a Wonderful Life and On Dangerous Ground are available on DVD and video on demand. A Woman's Face will air at 4:15 am Oct. 21 on TCM. Available for streaming on FilmStruck and on DVD and video on demand. Swing Time didn't make it in my top five, but I couldn't leave you without Fred Astaire and Ginger Rogers warbling "A Fine Romance." This snowy musical number will leave you with a smile on your face. Swing Time is available for streaming on FilmStruck, DVD and video on demand. As always, feel free to leave your picks in the comments section, and check out the other blogathon entries for more winter films. An absolutely fabulous list. Folks would do well to keep it handy. Battleground, The Thing from Another World and On Dangerous Ground are particular favourite of mine (when the blogathon came up I could have kicked myself for already having talked about them). The Bishop's Wife becomes dearer to me each Christmas season. Track of the Cat has become more fascinating with time. The Bishop's Wife is one of those films that just sneaks up on you. At first, you think it's just a fun rom-com, but it really is profound in its own way. Great stuff. Battleground is one of my favorites. And i feel your heat, fellow Midwesterner! It's supposed to rain today. Fingers crossed! A terrific list – it has my Approval (haha). Also, I'm very glad you included Fred & Ginger in "A Fine Romance". That scene never gets old. It's a great example of the charm of the Astaire-Rogers movies. I love the variety of picks for this list! Different genres and tones, all taking place during winter. Christmas In Connecticut is one of my all time favorites! I'm so happy to see it on your list. It wouldn't be Christmas without watching Christmas in Connecticut every year.